Despite debuting at number one upon release last fall (and subsequently winning the best album Juno), a year later "Reflektor" feels like a cultural disappointment, having failed to expand their commercial or critical reach. It's not a bad album, but for a band with two bona fide classics under its belt, it wasn't good enough. But if the record didn't sound like it was coming from the biggest band in the world, the live show sure as hell does. The end of summer has also brought about the end of the Arcade Fire tour, which concluded its 74-date run this past weekend with a sold-out Molson Amphitheatre show in Toronto before a hometown finale at Montreal's Parc Jean-Drapeau. To call it an unequivocal success would be an understatement, not least because "Reflektor," the post-mainstream breakthrough record they've been touring, was itself something of an understatement. Perhaps it would have been tough for any album to follow "The Suburbs," which ran the gamut of music awards from taking album of the year at the Grammys and Junos to winning the critic-voted Polaris Music Prize. Still, despite debuting at number one upon release last fall -- and subsequently winning the best album Juno and the Prism prize for their "Afterlife" video -- a year later "Reflektor" feels like a cultural disappointment, having failed to expand their commercial or critical reach. It's not a bad album, but for a band with two bona fide classics under its belt, it wasn't good enough. But if the record didn't sound like it was coming from the biggest band in the world, the live show sure as hell does. 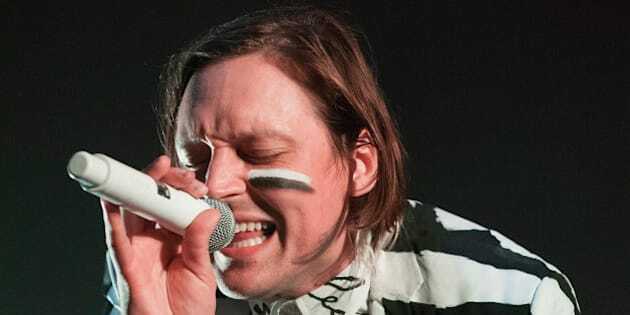 This was the second time Arcade Fire rolled through Toronto, after an arena show last March, and fans were perhaps less inspired to don the formal wear or costumes that the tickets still requested. But if they were a little more sartorially blase, their enthusiasm remained full bore from the winkingly epic intro -- John William's "Jurassic Park" end credits followed by an announcer saying "In the land before time there was Arcade Fire" -- until the sincerely epic encore. After a scene-setting "Normal Person" the mirrored ceiling comes down and the band burst into their career-making "Rebellion (Lies)" with a massive performance built for sprawling festival headlining sets. The presence of a up to a dozen players on stage, including superstar violinist Owen Pallett and a trio of Haitian percussionists, certainly helps Arcade Fire's inherently big sound grow even larger but much of the effectiveness is from frontman Win Butler's genius at working with mass audiences. Ignoring the inward tendencies of far too many indie rockers, he stands on an amp and plays a veritable cheerleader (or, given their back catalogue, evangelist) as he gets the crowd clapping out a beat or joining in on the oohs and other singalongs. It's the inspiring, life-affirming nature of the concert's massive communal experience -- especially on classics like "Ready to Start," "Neighborhood #1 (Tunnels)," "The Suburbs" and "Sprawl II (Mountains Beyond Mountains)" -- that makes their "world's biggest band" moniker make sense. But it also felt nostalgic, not because the band's been around a decade now, but because their aesthetic, if not their sound, is so reminiscent of the 1990s. This past year in music has felt like it was almost as much about 1994 as 2014 -- the anniversary's of Kurt Cobain's death, Nirvana's induction into the rock&roll hall of fame and the mind-boggling number of classic albums that turned 20 -- and Arcade Fire is the 2014 band that best represents the spirit of '94. The best thing about the early '90s was that all these outsider bands like Nirvana or Nine Inch Nails weren't just the purview of the cool kids. They were, however briefly, selling millions of albums and dominating radio and video. Arcade Fire traffic in similarly accessible alt-rock, as watching the crowd sing along to anthem after anthem makes abundantly clear. But they remain an alternative to the mainstream nonetheless, as their uniqueness also makes clear, whether it's sending out a papier mache doppleganger band to play Teenage Head's "Picture My Face" or having Regine Chassagne, in a gold dress, sing part of "It's Never Over (Oh Orpheus)" in French or the inclusion of freaking clarinets. Rock music is on a decided downswing as of late, and even the James Murphy-produced "Reflektor" was sold as Arcade Fire's danceable answer to the rise of EDM and hipsterdom's turn towards pop, but it's the fault of indie music's refusal to give the audience what they want, which is engagement. Watching the confetti cannons burst during rave-up "Here Comes The Night Time" and listening to the audience sing the "oohs" and "aaahs" of all-together-now anthem "Wake Up," makes you realize the emotional power that mass popularity can bring. Hopefully, Arcade Fire's now-finished victory lap around the world will convince their peers to wake up, too.